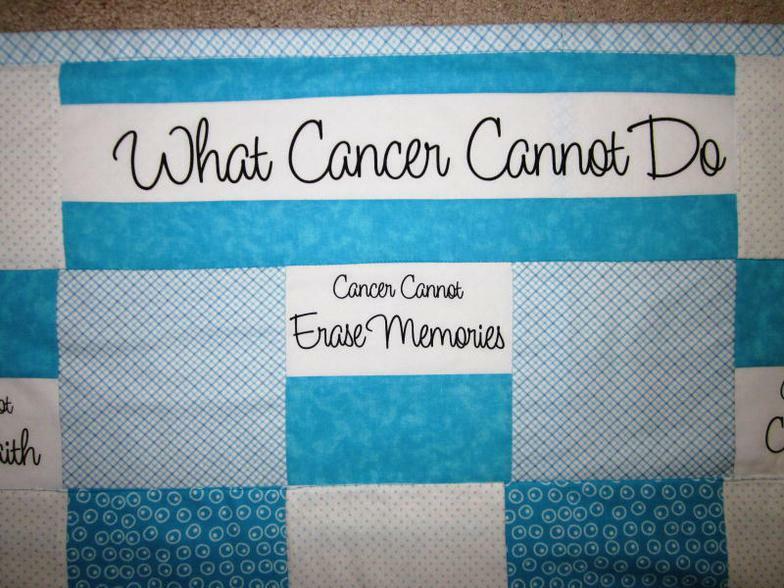 .The whole idea for selling quilts and to be able to afford to give some away was through the experience of going through cancer treatments like chemo-therapy. It is very cold in the room and it felt cozy and warm to have a blanket to put over you other than the one in the Doctor's office which was used over and over again. In trying to reach out to others I(Faith) thought that I could take the time to make some, sell some and therefore afford to give them to those that need encouragement during their trying time. Each quilt takes about 15 hours. During that time, I pray that God would touch the one that would receive a quilt. Some buy a quilt that we may give it to others. We want cancer survivors to find Hope, Opportunities, Peace, And Encouragement. 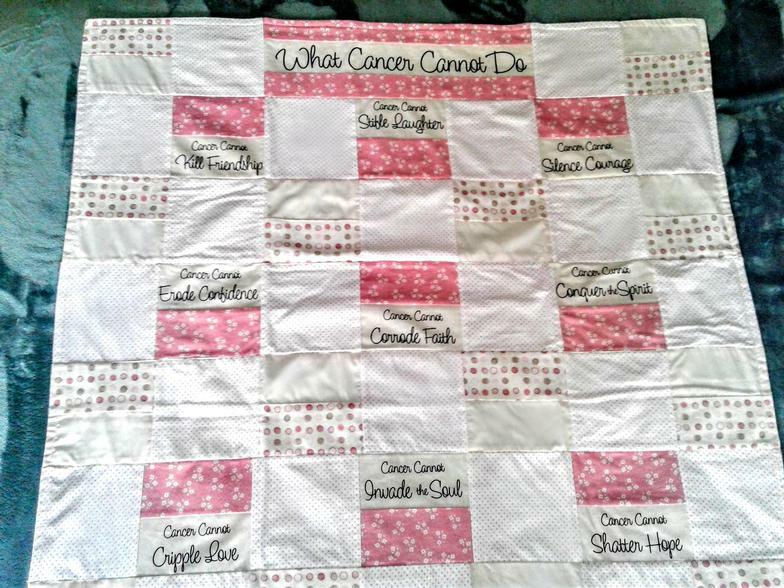 "What Cancer Cannot Do Quilt" A quilt with many quotes like" Cancer cannot take away hope, or kill friendship, or erase memories, cripple love, or stifle laughter etc. a total of 12 sayings. "Cancer Cannot Erode Confidence", Cancer Cannot Shatter Hope", Cancer Cannot Destroy Peace", Cancer Cannot Silence Courage", Cancer Cannot Erase Memories", Cancer Cannot Cancel Faith", etc. 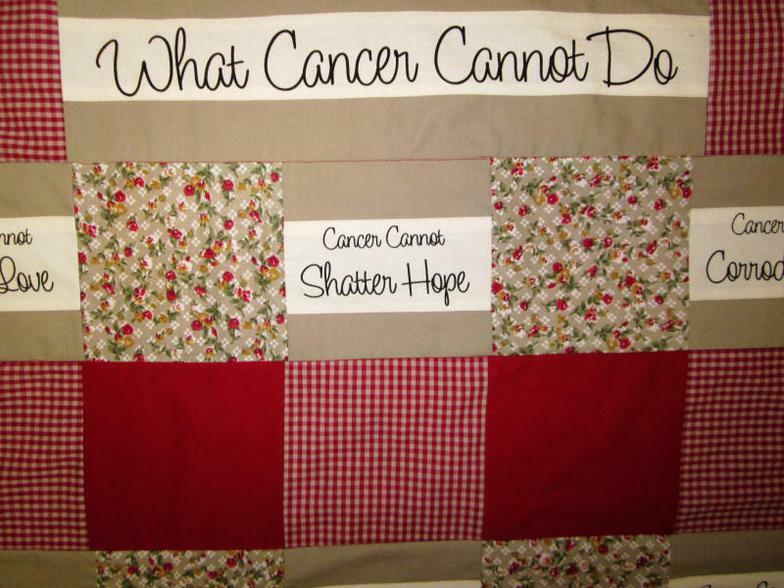 A flannel quilt to take to chemo-therapy to stay warm in the cold room. This quilt was prepared with prayer for the one to receive it. A gift for anyone facing cancer treatments. Dimensions are 52 inches by 41 inches. This rag quilt was prepared with prayer for the one to receive it. A gift for anyone facing cancer treatments. Dimensions are 52 1/2 inches by 41 inches. 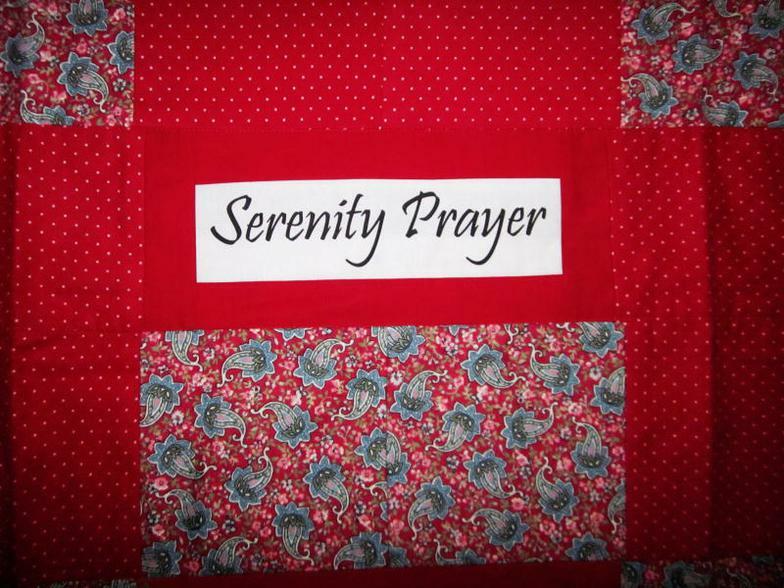 "The Serenity Prayer Quilt" is a beautiful prayer for everyone especially for those that have been diagnosed with cancer. It says, "God, grant me the serenity to accept the things I cannot change, The courage to change the things I can, And the wisdom to know the difference." The basic color is red. A great reminder that we can go through much, with the right attitude and with the help of God. The prayer is attributing it to Reinhold Niebuhr (1892-1971): In spite of the photo the quilt is rectangular with equal sides. Thank you for your support to the "Hope Through Cancer" ministry! Let us know that you are praying for this ministry.